Personality Assessments can help you understand yourself. Everyone is unique and complicated. Assessments provide language that describes what you naturally do based on a theory. There are two common theories of personality: type theory and trait theory. We offer assessments in both to give you the most choices. The Myers Briggs Type Indicator ® is based on type theory. Used by millions of people worldwide to improve communication, reduce conflict, team building, leadership, and career transition. Based on Carl Jung’s Theory of personality types it will categorize you into a personality type and provide insightful information about you based on over 40 years of research. We offer 7 different MBTI reports including: The Step I, Step II, Career Report, Communication Report, Organization Report and Team Report. These reports also come in many languages including Spanish, Dutch, German, Italian, Japanese, Italian, Norwegian, Chinese, Russian, Portuguese. The 16PF is based on trait theory and is based on the work by Raymond Cattell. Trait theory says that personality cannot be categorized into distinct types but that behavior is on a continuum. The 16 PF examines 16 factors related to personality. You can see where you fall on each dimension. Choose a test below to get started! Not sure what test to take? Get results from several tests in one of our test packages. Once you place your order you will be linked directly to the test center with your unique access code. 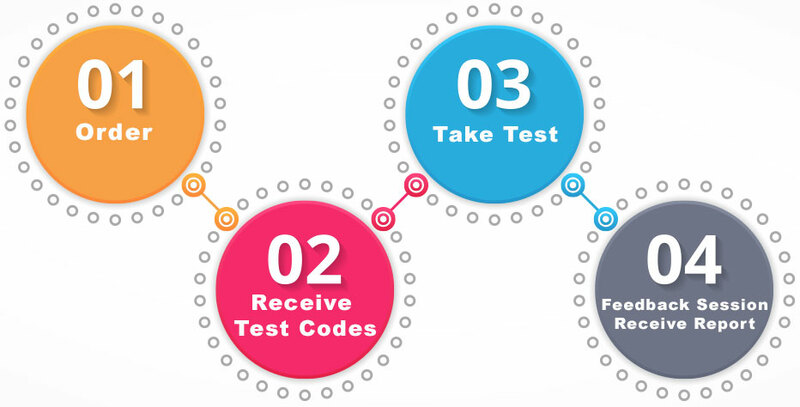 Also, an e-mail will be sent to you providing the access code and test center link. You can start and stop the test until it is complete. For groups each person receives their own unique code. Discounts are given for ten or more people. It's that easy and fast - you can be ready to go in 5 minutes. If you have additional questions, send an e-mail to support@discoveryourpersonality.com or call (858) 571-3931. Past clients include Starbucks, Microsoft, Kaiser Permanente, Merck, and more. (Click here to see the client list).